plates from various patterns by known makers, dessert services, and more. At times, I questioned just how much interest the items would garner. When auction was over, the pottery and porcelain alone topped $200,000. Among his collection was lovely Limoges dinner plate with a deep royal purple and gilt border, a center eagle with shield, and "E Pluribus Unum" waving below. It is tough to admit that in my haste, I overlooked the plate as something significant, overwhelmed by the sheer volume of objects we were handling. Fortunately, a ceramics specialist recognized it as having come from an extensive service ordered by Mary Todd Lincoln for the White House in the spring of 1861, at a total cost of nearly $3,200 (thank goodness for random knowledge of what some might consider useless information!). With proper research, the single plate (with a chipped rim no less!) fetched an impressive $3,900 - largely, of course, due to the important historical connection. Conversely, the collection also included hand painted porcelains whose history and even painter will never be known, but whose value is found in incredible detail and artistry. Though functionally obsolete, these works of art can sell for thousands of dollars when in pristine condition. Other notable ceramics that command impressive prices today include folksy designs like mochaware, early Chinese porcelains, and preppy forms of Majolica. Our Columbus issue includes, in fact, a relaxed lake home filled with luxurious pink, green, and white fabrics a la Lilly Pulitzer, accented by some amazing figural majolica. The head of house these days? Someone who not only placed her post-it on Grandma's china, but has embraced the spirit of hospitality and grace that is so epitomized by a beautiful piece of yesterday. sl Amelia Jeffers is an nationally-known auctioneer and appraiser who has worked in the fine art, antiques and bespoke collectibles market for over 20 years. 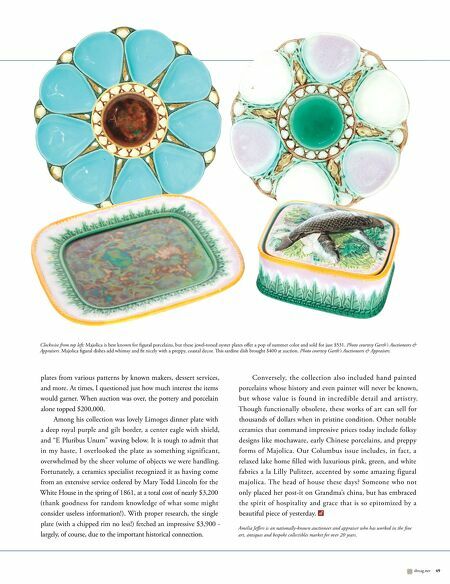 slmag.net 49 Clockwise from top left: Majolica is best known for figural porcelains, but these jewel-toned oyster plates offer a pop of summer color and sold for just $531. Photo courtesy Garth's Auctioneers & Appraisers. 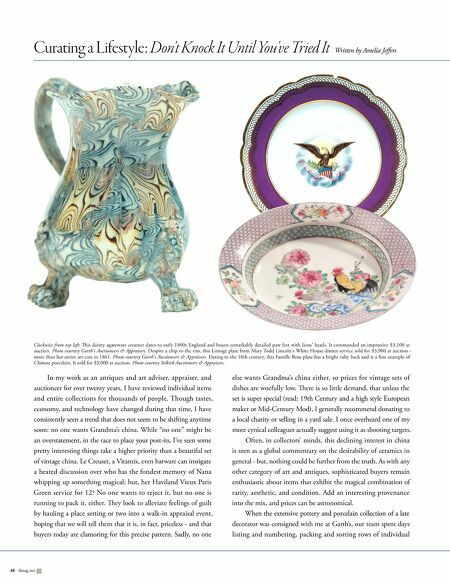 Majolica figural dishes add whimsy and fit nicely with a preppy, coastal decor. is sardine dish brought $400 at auction. Photo courtesy Garth's Auctioneers & Appraisers.